French Fauvist painter, born on June 17, 1880 in Chatou, and died on September 8, 1954 in Garches. After his secondary studies, he/she begins painting to 1895 and regularly visit the Louvre where see the primitive. In 1898 and 1899 he/she attends the Academy Camillo in Paris, where he/she met Matisse and Marquet and later Rouault; He/She spent a season in Britain and is interested in the works of Pont-Aven. In 1900 he/she meets Vlaminck, who shared a Studio and who joins a great friendship; his early paintings are landscapes of Chatou. In 1902, with Vlamink, view the works of Van Gogh exhibited at the Bernheim-Jeune Gallery and studied in depth the art of museums. Read many novels realistic and Nietzsche and impress le Cezanne and Toulusse-Lautrec, whose works in the Salon des Indépendants. In 1903 he/she painted the dance of Suresmes and in 1904 is inscribed in the Julian Academy; He/She paints landscapes and still lifes. From this time, he/she is interested in the black art and knows to Apollinaire. The landscapes of the 1905-1907 period are painted in bold colours, rapidly applied, in spontaneous compositions, such as Westminster Bridge; in these years he/she abandons the divisiveness and adopts a new conception of light which negates the shadows. In 1905 it comes into contact with the art dealer Vollard who buys all of its production and exhibited at the Salon d'Automne alongside Matisse, Vlamink, Marquet, Rouault, during which Louis Vauxcelles first used the term fauve in a review of this group. In 1906 are the female nudes first in his work, he/she travels to London and starts to paint his series of the Thames. It is the Fauvist who first used the ethnographic art as a source of inspiration, he/she comes to have a large collection. On the Thames (oil on canvas, 1906). Staten Museum (Amsterdam). 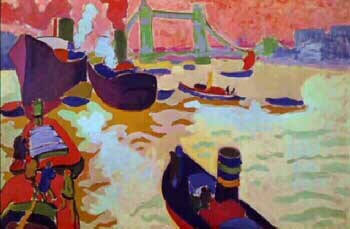 His Fauvism goes through many variations, from pointillism to free brushwork, but the most characteristic are works such as London Bridge (1906), painted in large areas of strong colors, with the distorted perspective, buildings cut against the sky in green and blue color contrasts and the masses of color define the depth. In Paris, he/she rented a Studio in Montmartre and is related to the Group of the Bateau-Mintography, where it receives the influence of Braque and Picasso, although his painting never is Cubist. The following year he/she makes his first sculptures, inspired by his interest in primitive sculpture; they are stone carvings representing rigid figures. It participates in all the salons of Paris until 1909, year in which exhibits with Braque and Van Dongen at the Gallery Kahnweiler. From 1911, it distances itself from the Cubists, and under the influence of French and Italian primitives, beginning what has been called his Gothic period. 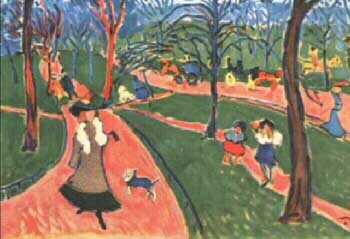 In 1912 he/she exhibited at the Stedelijk Museum in Amsterdam and is committed exclusively to Kahnweiler. He/She exhibits at the Armory Show in New York in 1913 and in Moscow, Prague and Berlin. In these years his paintings are a fusion of the Cubist and neoclassical styles; make sculptures carved in stone and masks influenced by primitive art, which follow a direction other than his painting. His first individual exhibition is in the Paul Guillaume's Paris Gallery in 1918. In 1928 he/she received the first prize at the Carnegie International in Pittsburgh and in 1930 he/she made his first solo exhibition in New York's Knoedler Gallery; from this moment enshrined in the United States, where it makes numerous exhibitions. It is also a prolific illustrator of literary works in the interwar period. His interest in classical painting takes you in its second phase to return to the sources of Cézanne, Poussin, Chardin, abandoning the experimental attitude that characterized his early years of work. 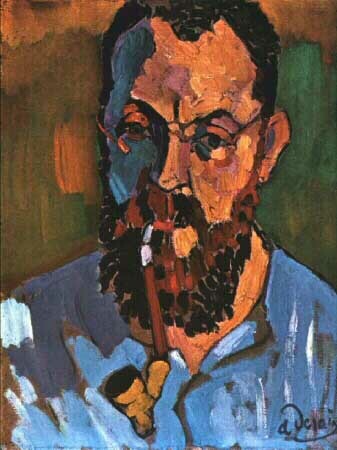 Matisse portrait (oil on canvas, 1905). Tate Gallery (London). Hyde Park (oil on canvas, 1906).